HIT THE SUBSCRIBE BUTTON TO RECEIVE EXCLUSIVE DEALS THE FIRST OF EVERY MONTH! FREE SHIPPING ON ALL ORDERS $75+, NO CODE NEEDED. 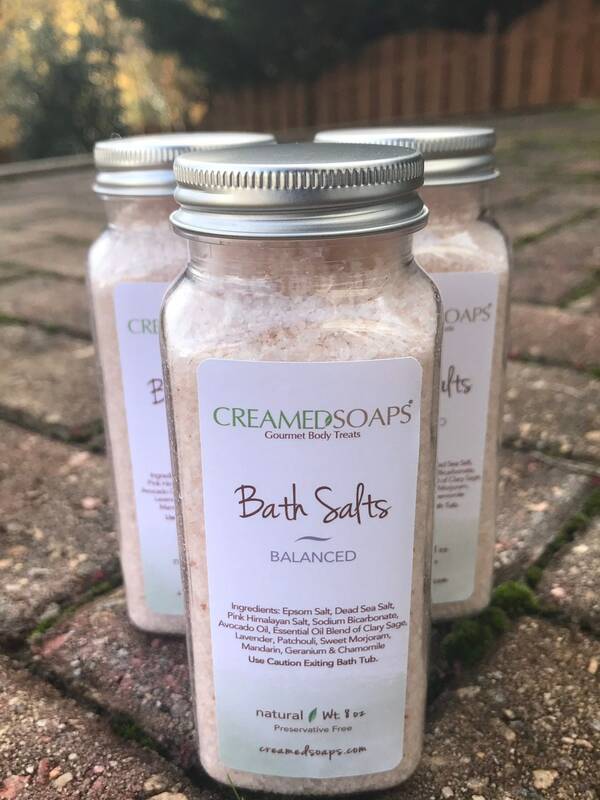 CreamedSoaps proudly offers you Aromatherapy Bath Salts in our favorite blend "Balanced'! This bath soak allows you to relax and soothe your tired muscles while moisturizing at the same time! In our humble opinion, the most alluring scent is the smell of saltwater mixed with this essential oil blend of Clary Sage, Lavender, Patchouli, Sweet Morjoram, Mandarin, Geranium and Chamomile on the skin!!! Epsom Salts, Dead Sea Salts, Pink Himalayan Salt and Sodium Bicarbonate are blended with Avocado Oil for moisture and then scented with a unique essential oil blend sure to offer relaxation!